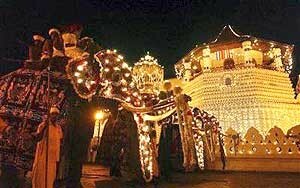 The glittering Esala Perahera, which is 235 years old, is one of the grandest events in Sri Lanka. Many locals and tourists look forward to witnessing this wonderful festival every year. This is held during the Esala month, in August, honoring the sacred tooth relic. Many travelers who have been fascinated by the Perahera have written notes about it; among them is the famous British poet and novelist, D. H. Lawrence, who describes the Perahera as a "perpetual fire-laughing motion among the slow shuffle of elephants." The Sacred Tooth Relic (Dālada) of the Buddha is the most venerated object of worship for Buddhists. Its present house, the Temple of the Tooth Relic (Dālada Māligāwa) in Kandy, Sri Lanka is considered the foremost sacred place of worship in the Buddhist world. Legend has it that 1,700 years ago one of the Buddha’s teeth was stolen from his funeral pyre and smuggled into Sri Lanka. Today, the relic is a sacred symbol for Sri Lankans and housed in the country’s most sacred temple, Dalada Maligawa (Temple of the Tooth). In its current form, Esala Perahera incorporates Hindu deities into its festivities, as four of the parades now start at Hindu temples. There’s a parade for every night of the festival (10 in all), with the processions getting longer, more intense and increasingly colorful as the festival gets underway. The parades are a sensual spectacle: you’ll inhale wafting incense, jasmine and frangipani bouquets; sway along to the incessant drum beats; stare in delight at the elephants and dancers adorned in exotic costumes; and gasp in awe as fire eaters swing burning coconut husks from chains and men crack whips to scare away demons only inches from people’s faces. Decadently dressed dancers, incessant drumming, the intoxicating scent of incense—it’s no wonder the famous British poet and novelist D.H. Lawrence once described Esala Perahera as a “perpetual fire-laughing motion among the slow shuffle of elephants.” Honoring the tooth relic of the Buddha, this festival makes you feel you’ve been transported to a tribal gathering hundreds of years ago, only now there are cameras, and you’ll want to take plenty of photos. The ceremonial cutting down of a jack tree blesses the beginning of the festival, and the first five nights, known as Kumbal Perahera, host intimate gatherings at shrines and small processions just off Kandy Lake. The last 5 nights, known as Randoli Perahera, get progressively larger and more intense until the last night, on the full moon, when you’ll witness one of the most feverishly energetic parades ever. 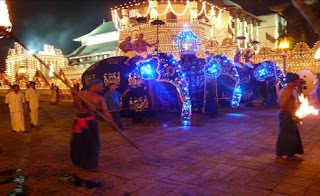 While the procession has a reputation for running long, you know the climax is coming when the Maligawa Tusker, a carriage with a replica of the Buddha’s tooth, arrives. Before you know it, there’s a parade of enormous elephants decked out in their finest silk costumes swaying to the drumbeat. The next morning a “water cutting” ceremony through the Mahaweli Ganga River ritualizes the divide between pure and impure and honors the water gods for a good year ahead. A goblet of water from the ceremony is stored and used in the tree-planting ritual that signals the beginning of the next year’s festival. Esala Perahera is one of the world’s best examples of how collective effervescence can encompass not only locals and devotees, but anyone who’s lucky enough to take part in this ancient, alluring festival.